CD SALE - BLOG HOP! HELLO JUNKIES and FRIENDS! 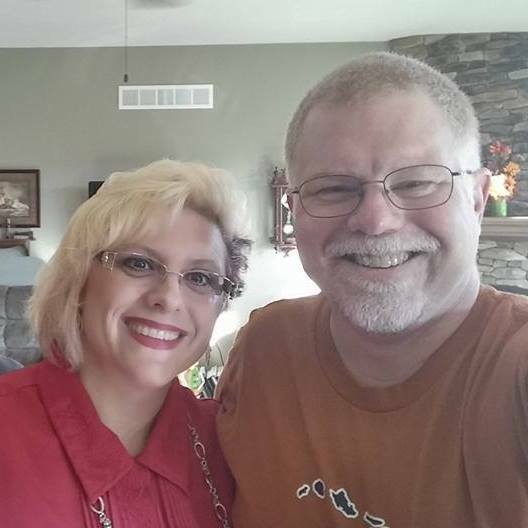 Welcome to the Technique Junkies CD Blog Hop! Today's cards are in celebration of the Annual Technique Junkie CD sale - all ANNUAL CDs are just $10.00 plus postage! This is a huge savings, and is a great way to catch up with techniques from precious issues. Each of the CDs has between 70 and 100 tutorials on them, each in step-by-step, pictorial format. Information about each CD, with a list of what is on each and a link to order, is HERE. If you started here, you may want to head back to the Design Team blogs you can see all of the gorgeous artwork from the beginning. If you arrived here from Technique Junkie's blog, you are in the right place! I always enjoy Judy's work, she does a beautiful job! The CD I am featuring is CD 2. I have selected two cards - one from the JUNE/ JULY 2004 issue and one from CD_'s bonus techniques. Each Cd has 10 bonus techniques on them that are only found on the CD!" On the second card I created, I used the Triple Time June/ July 2004 technique. Stamps: Hero Arts and Stampin' Up! HERE IS A LIST OF THE FABULOUS CDS! Don't forget you can purchase them all out HERE. Thanks for stopping by! Hope you all have a GREAT day! Hello Everyone!!! It is Saturday which means it is SWEET STOP SKETCH day! This week, I decided to pull out my Gelatos and get CRAFTY! I used my water spray bottle and misted the image and colored the image from the Natural Beauty Collection from Susana's Custom Art and Card Design with the white Gelato then stamped it on the black card stock. I cleaned the stamp and misted it with water, then colored the Gathering Love image with the Black Gelatos and stamped it on the white card stock I cut out with the Large Spellbinder Circles. Have you seen the silicone molds Susana carries? I decided to play with those this week too! I pulled out my CLAY to play awhile. Susana has several types and colors of clay, the Martha Stewart White Clay and there are many colors of the Air Dry Clay too. You can scroll down to see the MANY fabulous accessories and tools to use with your clay!! To create the butterfly embellishment, I used the Martha Stewart Silicone Mold- Garden with the Martha Stewart White Clay. Once the clay was hard, I painted it with the Inspirations Paint in Blush and Antique Silver. For the strips on the side panel, I used the GORGEOUS C'est La Vie Melissa Frances 6x6 Paper Pad. Susana has GREAT prices and she has papers ON SALE HERE. I added some Silver Viva Pearl Pen to further embellish the project. Hi Everyone - Just a quick post today. Sharing a project I made for this week's Peachy Keen Challenge - Anything Goes! Thank you for taking a peek! Have a great day! Hello Everyone! 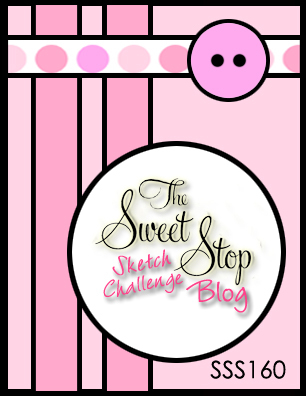 It is Saturday and that means it is SWEET STOP SKETCH DAY! I love having a sketch to Inspire me and this week, our sketch has a TWIST! I created a 4 1/4" x 5" sheet of card stock using the Dream Weaver Paste and the Basket Weave Stencil. (I placed the stencil on an angle and used the handy dandy Dreamweaver Stencils Spreader) and allowed it to dry for a half an hour. I then used the Ranger Perfect Medium Clear and tapped on the raised embossed edges and then stippled the Aged Patina - Pewter on that. Using Black Staz On Ink, I stamped the Susana Loves Stamps, Come Hither Eyes image over the Pasted/ pearled area and cut out the skirt portion to paper piece her outfit. To clean my stamp, I used the FABULOUS ScraPerfect Best Cleaner Ever. Have you heard of this product? I personally am AMAZED...it cleaned stamps that I had built up Staz On ink on it easily! On the shirt/ top and wings of the Come Hither Eyes image I used the very corner of the Ranger Perfect Medium Clear pad and traced around the edges. I then stippled the Aged Patina - Pewter onto the top and used the Perfect Pearls Metallic, Perfect Pearl on the wings to give her wings a touch of shimmer! I included a few different angles so you can see the SHIMMER - unless you see this IN REAL LIFE you can only imagine it! 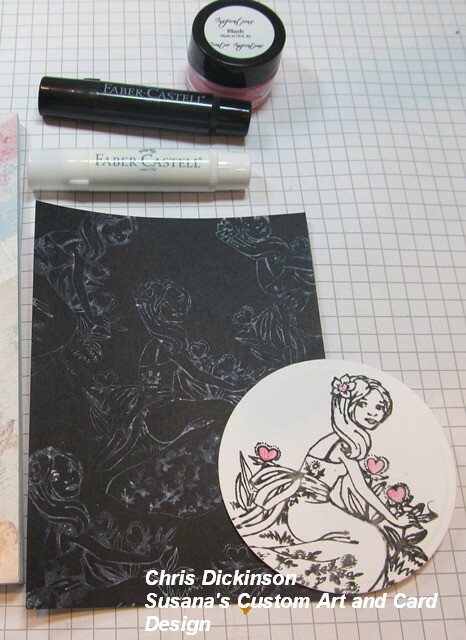 To create the background, I used the Tim Holtz Distress Ink Pumice Stone on the vanilla card stock. I then tapped the Perfect Pearls Metallic, Perfect Pearl over the entire background. Stamping the Unity Painted Punchinella image in Versamark (refills are here too!). I cleaned the stamp off and repeated that step to cover the entire background. Now, remember this week's Challenge is to use a RUFFLE, so I used the Technique Junkie Newsletter and the DOUBLE RUFFLE technique from the April/ May 2012 Issue. Once adhering all of the pieces together, the shimmer was FANTASTIC but I felt like the card needed something else, so I grabbed one of my FAVORITE Viva Decor Products, the Viva Pearl Pen Black and added some drops to finish this off. 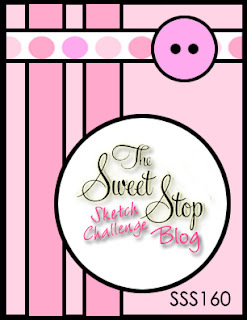 Today is Sweet Stop Sketch Day! Welcome! Today, I am sharing a project using lots of FUN toys! I started my project by using the Technique Junkie Newsletter and the technique Zen Stamping. To paint this SWEET little Slice of Life Peeker from the Sweet Summer's Peekers Collection available at Susana's Custom Art and Card Design, I used the SHIMMERY Inspiration Paints. Have you ever used these? They are so creamy, smooth and have just the right amount of shimmer in them! To create the Zen Stamping technique from the Technique Junkie Newsletter, I used the Copic Multi Glitter Pen Set . Here is this weeks sketch! Come join in on the fun! Here is how I created some of the fun details on this! I love that with the Silicone Molds (they are so cool!) I can create my own embellishments to coordinate with my projects. Using the Martha Stewart Garden Silicone Mold and my Crafting Tools, I gently patted the Viva Crystal Gel (Hologram) in the mold. Starting with a small amount and making sure I gently pat down to get inside each of the grooves to catch all of the fabulous details. Marti created a fabulous video HERE on SCACD with great details on how to use the Viva Crystal Gel and Silicone Molds. There are also a variety of colors of the Crystal Gel and other Silicone Molds available HERE. Allow time to dry - over night or 24 hours. I often make a bunch of these ahead of time and set them aside to color for projects when needed. Carefully peel out of the mold and there will be some gel that has dried and is stuck to the edges. This easily peels away. Using a Stipple Brush and the LuminArte Silks in Vaboom Red, I stippled the color on the Silicone Molded flowers and allowed them to dry while I stamped and painted the Slice of Life Peeker . I then layered all of the card stock using assorted Circle Punches and ran them through the Big Shot with an embossing folder. Susana has such a COOL variety of embossing folders! I adhered the Silicone Molded flowers with Mini Glue Dots. Thank you for stopping by today! Have a WONDERFUL Mother's Day!!! Hello Friends - I have post over at The Technique Trail today HERE! If you have time, go check it out! Have a wonderful day and come back tomorrow for some FABULOUS SCACD and SWEET STOP SKETCH FUN! Thanks for taking a look! Have a great night! Hello Everyone - It is Saturday again! Isn't it amazing how fast each week goes (weekends too! LOL) Today is another fabulous day and the Sweet Stop Sketch team is sharing another fabulous sketch created by my friend Korin Sutherland! I started my project with a piece of water color card stock. Using a water color brush and Twinkling H20's I did a quick wash over it to create a soft background then used a Heat Tool to speed up the drying. I then ran the Courtship Embossing folder through the Big Shot and using the water color brush and the Twinkling H20's - saturated the card stock to add more color. I heat set it with the Heat Tool and painted the Luminarte SILK Acrylic Paint in Vaboom Red as an accent and allowed the background to dry for a few hours. While the paper dried, I painted the tips of the Wild Orchid Craft Roses with the Luminarte SILK Acrylic Paint in Vaboom Red so I would have coordinating flowers to embellish my card. I used the twinkling H20's to paint the adorable Guardian Angel collection available now at Susana's Custom Art and Card Design. I used the cutie called Knowledge is Power Angel. I cut out a Circle Spellbinders and painted the border with the Luminarte SILK Acrylic Paint. I then added a layer with the Heart Circles Spellbinders Die, adhering them together using Mini Glue Dots. I used the ScrapPerfect Best Glue Ever to adhere all of the layers of card stock together and ScrapPerfect Best Cleaner Ever to clean the stamps I had stamped in Versamark Ink, sprinkled with Black Embossing Powder and heat embossed. Susana also has refills available HERE. I added a sentiment that came from a set from Unity Stamps. Hello Friends! Today, I have a post over at DRS Designs! You can check out all of the details on Leonard the Pig HERE. I hope you have a wonderful day!! !